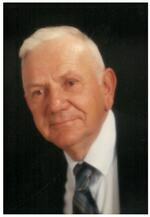 Leroy Miller Obituary - Shippensburg, Pennsylvania | Fogelsanger - Bricker Funeral Home, Inc.
Leroy Miller, 91, a resident of Providence Place, Chambersburg, formerly of Newville, departed this life on the morning of Tuesday, May 15, 2018. He was born on June 9, 1926, in Newville, a son of the late George and Eva Beaston Miller. Leroy was a U.S. Army paratrooper during World War II, inducted on November 14, 1944 and honorably discharged on November 11, 1946. Leroy retired from Letterkenny Army Depot, but his passion was lived as a full-time farmer. He was a long-time member of the Green Spring First Church of God, Newville, and the Durff-Kuhn V.F.W. Post #6168, Shippensburg. He is survived by his son, George Leroy Miller of York; his daughter, Cheryl A. Miller of Chambersburg; a brother, Herbert Miller of Newville; one sister, Betty Hancock of Newville; four grandchildren, Matthew (Julie) Miller, Georgeann (Brandon) Caspar, Christopher (Adessa) Miller, and Kim (Arpit) Mehta; six great grandchildren, Daulton, Jeffreyanna, Reagan, Bryce, Madison, and Landon; and several nieces and nephews. In addition to his parents, Leroy was preceded in death by one brother and one sister. His funeral service will be held at 3:00 p.m., on Friday, May 18, 2018, at the Green Spring First Church of God, Newville. Pastor Philip Steele will officiate. Interment, with military honors, will follow in the Newville Cemetery. Viewing will be one hour prior to the service on Friday, at the church. Memorial contributions may be made to the Green Spring First Church of God c/o: The Home Missions Fund at 1140 Greenspring Rd. Newville, PA 17241.